The Theatre on the Steps understands that your privacy is important to you and that you care about how your personal data is used. 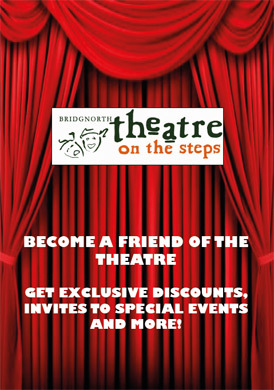 We respect and value the privacy of everyone who visits this website, www.theatreonthesteps.co.uk and will only collect and use personal data in ways that are described here, and in a way that is consistent with our obligations and your rights under the law. Data Protection Officer: Iain Reddihough. Supplying our products and/or services to you. Your personal details are required in order for us enter into a contract with you. With your permission and/or where permitted by law, we may also use your personal data for marketing purposes, which may include contacting you by email, telephone, text message, or post with information, news, and offers on our products and services You will not be sent any unlawful marketing or spam. We will always work to fully protect your rights and comply with our obligations under the GDPR and the Privacy and Electronic Communications (EC Directive) Regulations 2003, and you will always have the opportunity to opt-out. We will not keep your personal data for any longer than is necessary in light of the reason(s) for which it was first collected. Your personal data will therefore be kept until you tell us you no longer want us to keep it. If any of your personal data is required by a third party, as described above we take steps to ensure that your personal data is handled safely, securely, and in accordance with your rights, our obligations, and the third party’s obligations under the law, as described above in Part 9. How Can I Control My Personal Data? In addition to your rights under the GDPR, set out in Part 5, when you submit personal data via our Site, you may be given options to restrict our use of your personal data. In particular, we aim to give you strong controls on our use of your data for direct marketing purposes (including the ability to opt-out of receiving emails from us which you may do by unsubscribing using the links provided in our emails.You may also wish to sign up to one or more of the preference services operating in the UK: The Telephone Preference Service (“the TPS”), the Corporate Telephone Preference Service (“the CTPS”), and the Mailing Preference Service (“the MPS”). These may help to prevent you receiving unsolicited marketing. Please note, however, that these services will not prevent you from receiving marketing communications that you have consented to receiving. We will respond to your subject access request within 14 working days and, in any case, not more than one month of receiving it. Normally, we to provide a complete response, including a copy of your personal data within that time. In some cases, however, particularly if your request is more complex, more time may be required up to a maximum of three months from the date we receive your request. You will be kept fully informed of our progress. Our Site uses analytics services provided by Google. Website analytics refers to a set of tools used to collect and analyse anonymous usage information, enabling us to better understand how our Site is used. This, in turn, enables us to improve our site [and the products and services offered through it.